1-Ya thats the future boy Neymar. Following Neymar's performances for Brazil's U-17 team at the 2009 U-17 World Cup in which he scored a goal in the opening match against Japan former Brazilian football players Pelé and Romário reportedly urged coach Dunga to take Neymar to the 2010 World Cup. On 2 April, Hazard capped his 100th league appearance with Lille by scoring the second goal in a 3–1 win over Caen. The goal tied his career-high for goals in a season and also moved Lille eight points clear as league leader in the table. 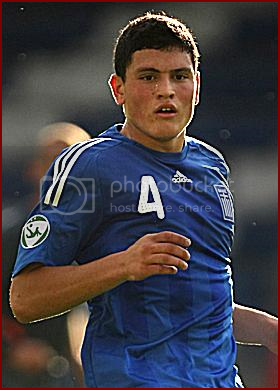 He was called for duty for the U-19 Greece team to participate in the Elite round of the 2007 UEFA European Under-19 Football Championship. He participated in all three group games against Moldova, Netherlands and Russia, helping Greece finish top and qualify for the finals. Youngest ever player to play in the Greek League at 15 years and 283 days. 4- Macheda : Famous among the woman of England and a player of Manchester. Probably the next big name in European football. 5- Gael kakuta : A Chelsea player as shown but presently on loan to Fulham. Best young player last season and chelsea can make him one big star after his return from Fulham.This video is enough to prove his worth. Kakuta moved to Chelsea in 2007 and became a key player for the youth team. He impressed at Chelsea after his first reserve game along side teammate Michael Ballack.Kakuta is a French youth international and has represented his country at all levels. He has scored a total of 15 goals in 45 maches from under-16 level up to the under-20 level. 6- Raheem sterling : Last but not the least: A liverpool player which is definately a future star. Gerrard has stated that he is going to make this boy the best wing ever. Now how motivating is that for this young load. Though only a youth player, on 14 February 2011 he was thrust into the national spotlight after scoring five goals for Liverpool's youth team in a 9–0 win over Southend United.